To say this house was a fixer upper was the understatement of the year. I am sure you are asking yourself “Why wouldn’t you just tear it down and start fresh?”. Downtown Charleston has a governing body known as the Board of Architectural Review whose purpose is “preservation and protection of the old historic or architecturally worthy structures and quaint neighborhoods which impart a distinct aspect to the city and which serve as visible reminders of the historical and cultural heritage of the city, the state, and the nation.” This means that in addition to the permits one has to get when building or renovating a property, you also have to get the approval from the BAR. Thankfully, my dad knew all this this before buying the property so he was prepared for the extra hoops to jump through. I’ll be posting another update in the coming months so be on the look out. This house is going to look great when it’s all said and done. 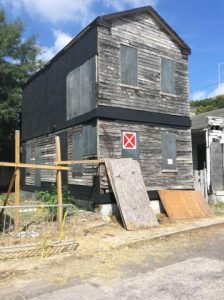 Do you have any questions about historic downtown Charleston or maybe you want to invest in a fixer upper? Call or email me, I would love to help!